There is no greater man than one who lives by his convictions and cherishes those around him, and Scott Bylsma was such a man. Rich in spirit, Scott placed his focus on the greater prize, and in so doing, he blessed many within his reach. Yet how does one even begin to describe the very heart of a man like Scott Bylsma? An ordinary yet extraordinary man who heard God’s voice . . . and listened. Scott may not have always followed the ways of the Lord, but when his heart grew to recognize the power of what Jesus truly meant in his life, Scott gave Him his all, and then some. The story of Scott Bylsma is one of redemption; of ordinary tales and experiences; it is about forgiveness and sacrifice, tragedy and triumph. Scott’s story is about coming full circle into a life of repentance only to find love unconditional and a spirit of love and joy that can only be found in Christ. Scott was many things to many people, but his true joy was found in his Lord, the family he loved with every fiber of his being and sharing God’s love with others. Scott was of service to others, accepting people and meeting them right where they were at to share God’s glory, and he did so until the very last of his days. Known as the beginning of the digital age, the year 1971 had many firsts. Weebles wobbled, and Etch-A-Sketch and the ever popular family game, Uno made their introduction. At the same time, turtlenecks, corduroy and wide bell slacks were all the rage. It was the beginning of America’s war on drugs and with the legal voting age lowered to 18, the Vietnam War continued to make headlines across the globe. In the midst of these ever changing times, Jack and Linnea “Lynn” (Larson) Bylsma of Grand Rapids, Michigan were happily anticipating the birth of their second child. On Thursday, April 8, 1971, Scott Daniel Bylsma made his debut, joining his older brother, John. An easygoing baby, Scott was the second of six children, eventually welcoming younger siblings, Kristi, Kerri, Kevin, and Matt. Their family home was on Bylsma Drive just off 8th Avenue and quite a bustling household, Jack and Lynn raised their family in faith with much love and dedication. Jack supported their large family working in the family business while Lynn made a wonderful home for Jack and the kids where priceless memories were made and enjoyed. In 1983 they moved to Northrup Drive NW. A young boy of his generation, Scott was an outgoing and personable young man. Throughout his youth he shared the friendships of many and enjoyed adventures along the way. Like all young boys, Scott experimented with “spreading his wings” and had his share of fun, yet the solid foundation of his faith and family remained his true, ever deep compass. Although a strong willed child, Scott was a dreamer and his mind easily wandered. West Side Christian School provided Scott with his early education and to keep him focused, his teachers had him sit in the front row. He and his older brother, John especially enjoyed snake and frog hunting and then coming home to have their mom cook up the frog legs. They often went to the gravel pits to go fishing. They’d even hide and play in the corn fields all day until hearing the familiar “bell” when it was time to come home. It was in middle school when Scott first took notice of the ladies, and they in turn noticed him. He could be a little more than mischievous, like on a daily basis making his sister, Kerri actually eat dog food. He also enjoyed biting the ends off of licorice rope, shoving bugs inside the hollow and then “sharing” them with others! Always one for adventure and living life a little on the edge, he liked jumping bikes on homemade ramps and playing hard won football games in the hard rain. Yet along with all this, Scott was beginning to show an aggressive side, too. His father took notice and as a way to work it out, he bought a punching bag for Scott and hung it up in the basement. Despite these growing pains, Scott and his family life was traditional. They were faithful members of their church and holidays were every bit a Swedish smorgasbord. Each Christmas Eve they spent with both extended families. Scott and his siblings were close to their cousins creating lifelong bonds. One year when they were all together playing the game, “bloody murder”, Scott ran into the back of his Uncle Tom’s Chevy Suburban and chipped his tooth. Through the years the Bylsma family enjoyed camping at Ludington State Park in the fall. No one will ever forget the wonderful Memorial Day, Fourth of July and Memorial Day celebrations at Scott’s grandma and grandpa Bylsma’s pool on Hillmount Drive NW. Like a rite of passage, everyone always loved the Bylsma softball games over Memorial Day at West Side Christian School where everyone would jump in their pick-ups and head over. It was in 1987, during Scott’s sophomore year of high school when Scott and his family sadly experienced the sudden death of his father. Scott’s mother clearly remembers him heading to the basement and hearing him just wail on that punching bag. It literally made the house shake, and when Scott finally retreated from the basement he had worn the skin right off his knuckles. Scott’s demeanor remained quite angry for some time. Left with six children to raise, Scott’s mother continued on with the help and prayers of Scott’s grandparents, extended family and good friends who were always a source of strength for their family. Through this tragic time in their lives, the Bylsma family bond was made even stronger. Even though there was an age difference of 12 years between Scott and his youngest brother, it was in 1997 when Matt was about to enter high school when the two brothers went on an excursion camping to the Porcupine Mountains before they both started new chapters in their lives. 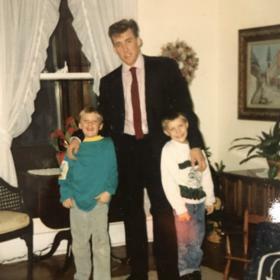 In fact, the two youngest brothers, Kevin and Matt even referred to their older brothers, John and Scott as their “bro dads”; they could be mean like brothers, but then love on you like a dad. Scott graduated from Grand Rapids Christian High School in 1989 and spent the summer working in Alaska. He then enlisted to serve in the U.S. Marines, completed his boot camp in San Diego, California and even managed to make a surprise visit home for Christmas that year. Scott was on active duty for a year and served with the reserves for a total of six years. He worked odd jobs here and there, did some medical transport and sales, but soon decided to enroll at GVSU in their criminal justice program. It was during this time when Scott met Sharon Kirchhoff who captured his heart. She had attended West Catholic High School and they came to know one another through mutual friends. Things seemed to click and in 1991, they had their first date over dinner and seeing the movie, Backdraft. Some of their favorite dates over the following three years included going to Hong Kong Inn in downtown Grand Rapids for Chinese food. Scott came to love and adore Sharon, and the feeling was mutual. She loved his strength and how he took the lead to take care of things. She liked the fact he was a Marine, yet could allow himself to be silly and adventurous. 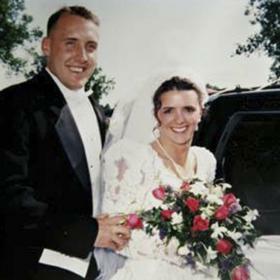 After a one year engagement, the two were happily married on June 3, 1995, at Westend Christian Reformed Church. After returning from their honeymoon to northern Michigan, Scott and Sharon made their first home together on the northeast side of Grand Rapids. By this time, Scott was completing his schooling and training through the Grand Rapids Police Academy while Sharon worked for Priority Health. 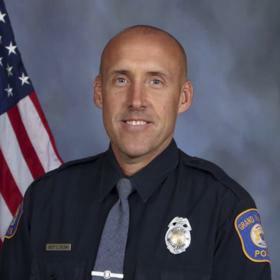 Scott was hired by the Grand Rapids Police Department in 1997 which certainly made his family proud. In 1998, Scott and Sharon moved to a home in the country on 92nd Avenue where they came to share the blessing of three children. Jacob came along in 1999, followed by Seth in 2002, and Molly completed their family in 2005. Scott loved their home in the country enjoying the fresh air, being outdoors and working on things. An outdoorsy type of fellow, he was always the last one to come inside. Along with family and friends, they enjoyed numerous bon fires and cookouts during the months of summer. A true family man in every sense, Scott was very driven and continued to be a dreamer. He was always into something new, and once he set his mind on something, he was bound and determined to see it through. He took everything on with a passionate spirit whether it was woodworking or running. Scott loved spending time with his family. He worked hard to provide for those entrusted to his care, yet he always found time to make memories along the way. Jake will always hold fond memories of learning to fish with his dad in the pond on their property. When it came to Seth, Scott was always trying to get him to try new things or do things he really didn’t want to do, like grabbing eggs from their chicken coop. Scott loved animals including chickens, goats, cows and horses. Growing up, a python he had escaped into the walls of their house not to mention the many lizards and geckos he acquired. Scott, Sharon and the kids enjoyed their hobby farm but Seth hated the chickens while Molly always looked forward to working side-by-side with Scott tending to their animals. As a family they liked camping at the Platte River Campground where fun times were always enjoyed with family and friends. 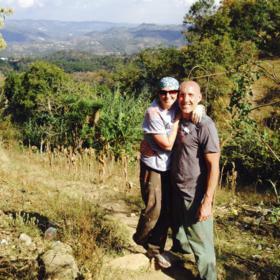 Scott loved special hiking trips with his boys and special times with Molly, too. They also camped on Mackinaw and the Upper Peninsula. Scott and his family spent many Spring breaks enjoying the beaches at Gulf Shores, Alabama with their entire family which came to be quite a crew. As always, Scott acquired the most beautiful and amazing tan, but then again, he always loved the beach and the sand in his toes. He especially loved going to the beach in Holland where he’d easily spend the day taking in the sun, sand and water. He’d swim the waves and body surf, and the bigger the better. Along with sun filled days, most often Scott could be seen without any shoes. He preferred it that way if possible, or maybe just flip-flops, even the pair he made. Through Scott’s adventurous spirit, he sometimes didn’t quite think things through as Sharon would have preferred. One night he decided to knock down a bee’s nest with a stick. In the process, Scott was stung several times and soon realizing he was allergic, the neighbors ran over with an epi pen and literally jammed it into his leg, possibly saving his life. 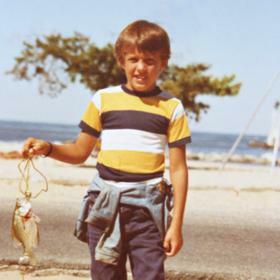 Scott loved to hunt and fish. Cutting and splitting wood at home with the kids helping him stack it up allowed Scott to be an example which was only one of many ways he did so. He was quite handy and liked building things with wood such as their chicken coop and wood shed. Scott learned a lot from watching YouTube. From 1997 to 2005, Scott became ecstatic about martial arts. He loved the workout, and it relieved stress all while affording him the opportunity to hang out with some of his co-workers before a shift. Scott ended up developing a slipped disc in his neck which required surgery and a plate. Needless to say, Scott had no choice but to give up martial arts. It was barely a week after surgery before Scott took up walking and then running. A go big or go home type of guy, Scott signed up for his first official race, the Bayshore Marathon in Traverse City. Running was Scott’s new passion. From marathons to ultra-marathons, he was involved in 100 mile races and the River Bank runs. When the River Bank Run lost its luster with Scott, he got involved with Team Triumph with his cousin, Alyssa. With teams of four “angels”, the teams pushed along a chariot complete with a captain, doing this for several years. Scott even got his kids involved in running. Jacob and Molly ran in several races with him and of course, for a while Scott was even into barefoot running, too! Some of the best times were enjoyed after early Saturday morning running groups Scott put together when they’d all convene back at his place for a pancake breakfast. Yet to say this time in Scott’s life was a turning point would almost be considered an understatement. Scott’s surgery had a profound effect on him. It gave him pause to “be still and know” . . . and for Scott that meant really knowing. His mother clearly remembers her friends gathering to pray. He felt the peace that can only come from God and later spoke how this was the point when he really came to Jesus in such a personal way. Only the beginning, that day in July of 2005 was when Scott’s life truly changed as he started to listen to God and to serve him. His sister, Kerri remembers a most blessed time with Scott which remains a treasured memory. After struggling with infertility for ten years and sinking into despair, Scott spent time with her, telling her it was time to give it up to God. Scott also had the blessing of leading Kerri’s husband to Christ. Giving their hearts up to the Lord in these ways proved to be fruitful when the Lord blessed their lives with the births of their precious, twin daughters. Music played a vital role in Scott’s life. It spoke to his heart, put a skip in his step and could lighten his mood. He sang in the choir during high school and later as part of the worship team at church. He instilled his love for music and how important it was to his children and the benefits of learning to play an instrument. Scott used it as a form of expression when he learned to play the tin whistle, harmonica and as he was learning to play the bagpipes. Scott’s favorite genre’s included Southern gospel, classical and old country, particularly the sounds of Johnny Cash. Next to his Lord, family remained Scott’s center. He liked watching movies with the kids with some of their favorites being Lord of the Rings, Marvel or horror movies. Of course, movie nights weren’t complete without Scott’s love for ice cream. If Sharon didn’t get a chance to buy his favorite Moose Tracks, he’d ask Jake to make an ice cream run. Mexican food was the ultimate meal according to Scott and he always looked forward to taco Tuesday at home. A favorite day for Scott would be spent alongside his family enjoying a warm summer day at the beach body surfing in the waves. They’d spend the day fishing, eating ice cream, and with no shoes! More changes were in store for Scott and his family. Through the leading of close friends, Scott, Sharon and the kids were invited to attend Life Stream Church in Allendale on Memorial Day weekend, 2011. Scott and Sharon both felt an inspiring connection with the church as it brought about a whole new spiritual dimension within them. Scott took his new found life in the Lord by storm yet in a deeper sense like never before. Later that year he was baptized as an adult and soon started Wellness Wednesdays at church for anyone who wanted to join him for a workout and devotions. He led bible studies, small groups and took part in several life changing mission trips to Guatemala and Haiti. In 2013, Scott attended seminary to dig even further into the Word. Having become an ordained minister, Scott’s desire was to spread the good news of Jesus. Psalm 46:10, “Be still and know that I am God” was repeatedly capturing Scott’s attention. It became quite obvious to him one day when he was exiting the shower when a picture, completely undisturbed, fell from the bathroom wall face up, and it read, “Be still, and know” . . . and Scott was ready to listen. Everything seemed to be going well for Scott and his family. What more could a hardworking, God loving man ask for? Yet the year 2017 began with added blessings when Scott was recognized as Officer of the Year by the Grand Rapids Police Department. Quite humbled, Scott was honored for this distinction not only within the community he served, but among his peers. Yet the unordinary blessing in disguise came merely a month later when after experiencing some health issues, Scott was diagnosed with ALS. Scott’s response was none other than, “Okay God, I hear ya”. Faced now with the ultimate battle of his life, Scott’s family all agree that he used his diagnosis as a way to glorify God by telling his story and sharing the good news of Jesus which for Scott was the ultimate blessing. Scott was a fighter and he was not willing to let ALS define him. Psalm 46:10 was very dear to him as he stayed the course, taking time and ultimately having the time to be silent with listening ears toward God. Despite his growing restrictions, Scott continued to live fully, preaching God’s love and His message. He was honored to have spoken at his son, Jake’s high school graduation, and other speaking opportunities. He hit the pavement once again in 2018 with his cousin, Alyssa and longtime friend, Matt Hollebeek when they pushed Scott as their captain in the River Bank Run. He loved sitting on the deck watching the storms roll in off the lake. Seth remembers most recently being out on the deck with Scott who was sitting in his wheelchair watching the rain begin until finally they were both soaked. Always up for the adventure, Scott slowly powered his way back into the house completely drenched but with the biggest smile. These are what memories are made of. Ever grateful, anyone who came to know and love Scott Bylsma are filled with deep gratitude. Like many, we find ourselves wishing we could get in one more “thank you” or to hear his infectious laughter. His smile and bright eyes could light up a room. When Scott spoke of God it was with unwavering passion and full of certainty. No one can know for sure the countless lives Scott touched through his life journey and the profound impact he had. We can only imagine how Scott’s passing has left a void in our hearts; it has been said that it feels like we’ve sort of lost our own spiritual “Yoda” from this life, and Scott would have smiled at that very thought. We could discuss all day the many things we’ve been able to witness and discover because of Scott. The challenges Scott faced were difficult beyond imagination, yet Scott glorified the Lord until his last breath. We’ve been blessed with the hope he’s shared, given the ear to listen, and the heart to embrace it. Scott shared the spirit of life and joy, and the Father’s unconditional love with grace, unconditional love and commitment. Scott has been a living testimony of God’s love for us all, and we can be eternally grateful that Scott and Sharon gave themselves to be used as a vessel in such a profound way. Scott set the example and will continue to be a light in the dark for his many years of service not only for our country but our communities. He practiced what he preached and never passed judgement. He wasn’t perfect, and never acted as though he was. He found confidence in his earthly life and had a heart to teach because of the strength he found in Jesus Christ. Scott’s energy created a comfort in people whose eyes weren’t initially turned toward Jesus in today’s chaotic world. Thank you, Scott for being a motivator; for your wise counsel, your authenticity, your vulnerability, and your grace. Even as we shed tears and our hearts are full of sadness, we’re reminded of all of these things Scott gave without hesitation and with so much love and joy in his heart. It brings a smile, and our sadness turns to joy. The service to celebrate Scott’s life will take place Friday, April 19, 2019, 11:00 AM at Life Stream Church, 6561 Lake Michigan Dr. Allendale. His family and friends will gather to share stories and offer support from 2-4 and 6-8 PM on Thursday, April 18, 2019, at Heritage Life Story Funeral Homes, 2120 Lake Michigan Dr. NW, Grand Rapids and on Friday at church for one hour prior to the service. Scott’s family wishes to thank Community Caregivers, the Susan Mast ALS Foundation, and Trillium Woods for all of their support and care throughout his journey. In lieu of flowers, memorial contributions in his memory may be made to Scott’s children in care of Sharon Bylsma. To share a favorite memory or photo of Scott and to sign his online guest book, please visit www.lifestorynet.com. Matthew 25:21 -- "His master replied, 'Well done, good and faithful servant! You have been faithful with a few things; I will put you in charge of many things. Come and share your master's happiness!"